When the weather dries up and you’re ready to begin work on that roof issue, locating the low spots can be tough. Of course, working in the rain on a roof is too, so it is important to know what areas may be problems and repair them before the rain comes. 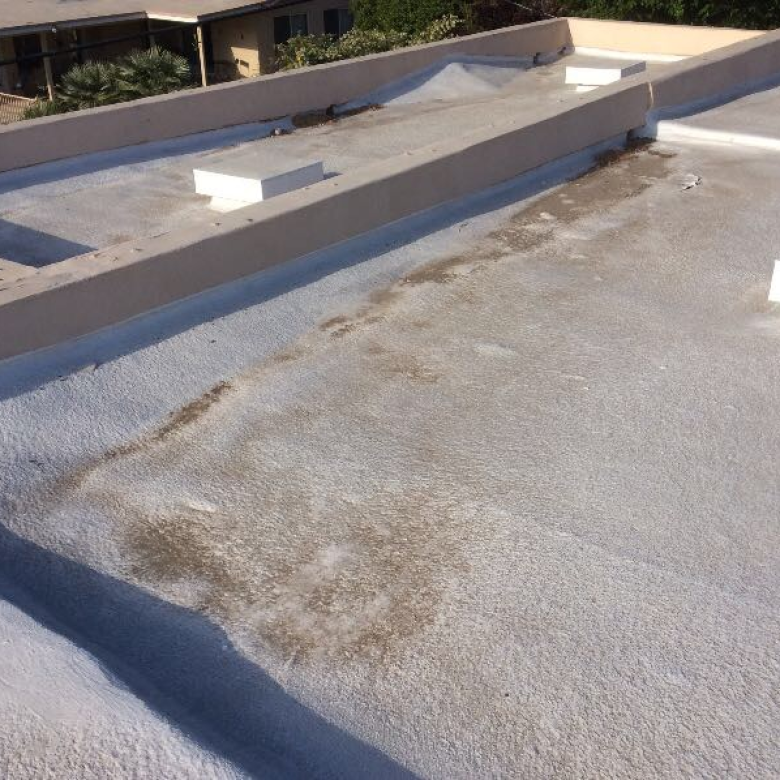 Here are several tips on how you can find flat roof low areas on your dry roof. Look over the roof. Do you see any dried up puddles? This is called ponding, a place that has settled and is pooling water, and a good potential area where a leak may occur. Areas like this are common if the building has begun settling and will hold rain water like a bowl. As this water pools, it weakens the roof material and gets through, so a leak will occur even if it hasn’t yet. If it has settled, then a product to build up the area will be needed, but you may have a structure, insulation or foundation issue to address before hand as well. Inspect the roof and locate all drains, downspouts and scuppers (drain heads that lead to a downspout). These drain locations will be a good indicator of potential low areas that may need to be addressed. 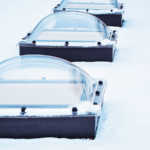 Inadequate or clogged drainage often leads to ponding water on the roof. If left unaddressed, this can cause sagging and weaken the roof over time, which will eventually cause a leak. Be sure to keep the roof free of debris and inspect it regularly to maintain the drains and downspouts. 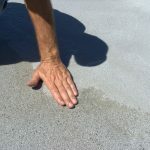 Once again, the initial inspection is key to expose dried water marks that may indicate past standing water. Roof insulation can settle over time and cause the roof to sag in spots, especially where HVAC units are situated or other equipment resides on the roof. It is important to inspect these areas and look for dried water marks to determine if you have a potential low spot. 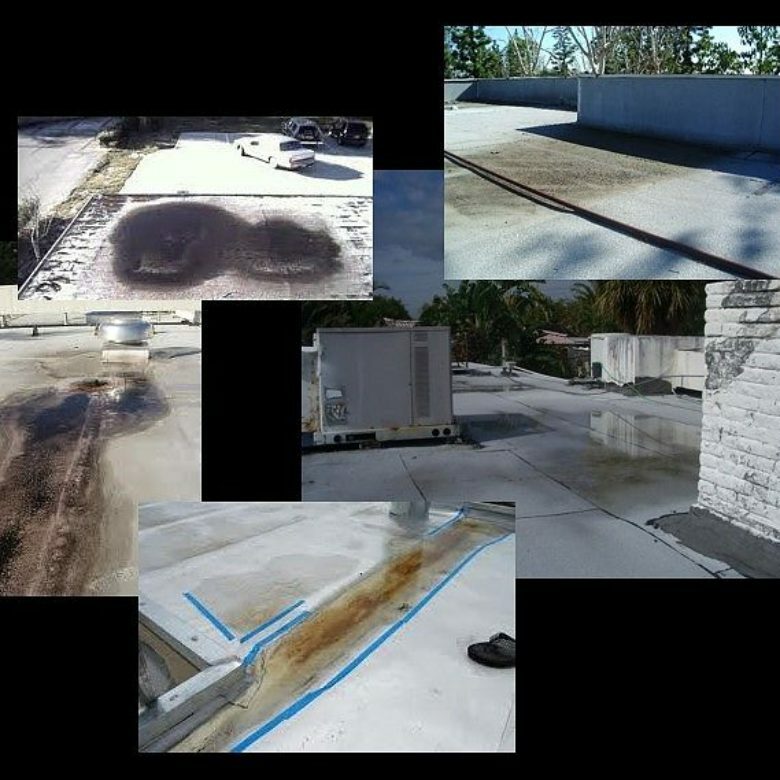 Your initial inspection may have led to these areas, but it might have been tough to determine why the low spot occurred. If you recognize equipment within an area where it is obvious water has been standing and dried, then you may have insulation that has become compacted and will need to be replaced. If all else fails and nothing presents itself, you may need to run a hose to the roof and get some water on possible problem areas to see if they pond and/or leak. Let the water run for about 10 minutes in an area to see if the pond occurs, and let it run slowly over the areas that you think are trouble spots. This will take a lot of patience, don’t lose heart or stop too early. As you are checking for ponds and leaks, be sure to wait enough time, allowing for the water to gather and expose a ponding area and then move on to the next dry spot. 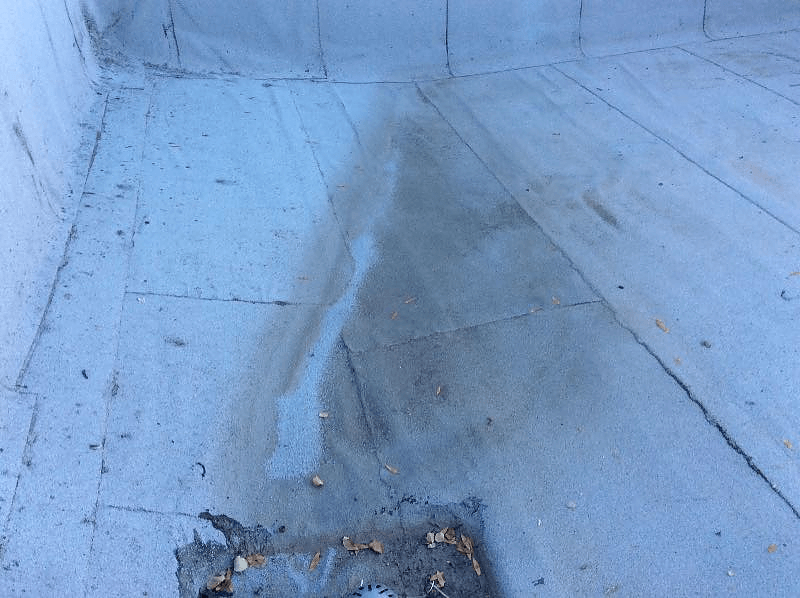 Simple cleanup and proofing is important to maintaining a roof, and maintenance prior to any potential ponding or pooling areas will be sure to keep your roof in good shape for some time. Remembering to keep drains and gutters free of debris and check them regularly, as well as inspecting areas where equipment is installed on the roof will help locate potential problem areas. These areas, if allowed to back up will cause water issues eventually, leading to costly roof repairs. If you are unsure how to locate these areas or just need someone to guide you, please, contact us, and we will do all we can to help you take care of your issue.